Successfully Added HD USB Web Camera with Microphone to your Shopping Cart. 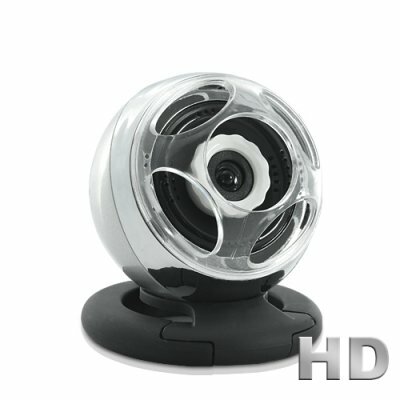 HD USB Web Camera with Microphone: Stay connected in real High Definition with this ultra convenient webcam! This compact plug-and-play USB Webcam with a built-in microphone offers computer and laptop users a quick and easy way to get high resolution video and voice communication. Place the webcam in front of you and adjust its viewing angle by opening its clip until it reaches desired position. Then, just connect it to your computer through a simple USB and you are ready to video chat! Don't worry about software drivers either, this web camera is plug-and-play for Windows 7, Macs, and Linux computers! This high performance HD Web Camera delivers clear and colorful images and moves with extreme fluidity. You will appreciate the ability to see your wife and children as if they were right there next to you. Of course this webcam works perfectly with popular messaging programs such as Skype, MSN and AOL Instant Messenger ensuring nothing will disturb your e-conferences, business talks with suppliers and hot chats with your lover. Get closer from miles away with this incredible HD Web Camera! It is brought to you at an amazing factory direct price so order it right now while supplies last. By your reliable source of electronic products, Chinavasion.